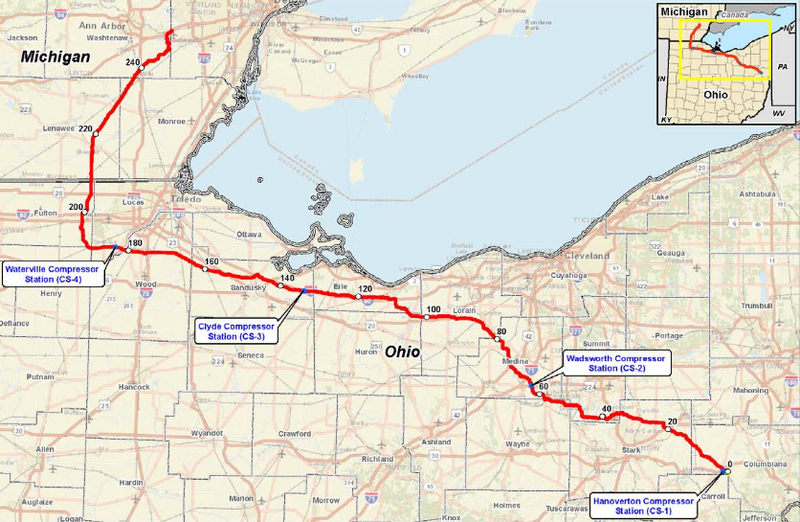 As far as Northeast Ohio is concerned, the natural gas pipeline is planned to run through fairly dense, almost suburban portions of Stark, Summit, Medina and Lorain counties. The 36-inch pipeline covers 256 miles, all told. The FERC environmental impact statement admits there will be "some adverse environmental impacts." The commission will establish an environmental compliance inspection program as the NEXUS project continues, watching for parent company Spectra Energy's compliance with environmental regulations. Well before the route was given this approval, however — up until yesterday, in fact, in the city of Green — surveyors have been entering private property Northeast Ohio to prepare the construction job. In some cases, armed officers from the county sheriff's office have accompanied them. "Spectra Energy is all about timelines," Jon Strong, a Medina County resident and an organizer of the Coalition to Reroute NEXUS, tells Scene. "They're trying to do everything they can to short-cycle to when they can start digging and putting pipe in the ground. On their side of the fence, it's 'We need to get all our surveys done, come hell or high water, as soon as possible.'" Multiple Ohio statutes have been upheld in county courts, favoring landowners' rights when it comes to private surveyors entering property. Additional civil cases are under way, which may or may not have an impact on NEXUS; Strong says that the work being done to cement property owners' rights will have an impact on future projects that involved survey work. Given FERC approval now, NEXUS construction is expected to begin in the spring. Note that, just last night, a pipeline exploded outside Kansas City. Last month, a pipeline exploded in Alabama, killing one person and injuring others. Safety concerns remain high on the priority lists of pipeline opponents, alongside legal, environmental and business-related issues. Last year, Scene traveled to the Marcellus-Utica Midstream Conference in Pittsburgh. (The "midstream" portion of the energy industry refers most commonly to pipeline transportation.) During a Q&A session with Barry Davis, CEO of Enlink Midstream Partners, we asked about the long-term impact of drilling and pipeline construction — i.e., what are Americans to make of the inevitable financial bust and environmental harm that will always be a part of the business cycle? Davis demurred, citing a 40- to 80-year lifespan for most wells. The Ohio Chamber of Commerce has publicly stated that the pipeline construction and operation will create 6,800 jobs and provide an $830-million economic impact. "I'm not fighting the fact that you want to build a pipeline," Strong says. "I'm fighting the fact that you want to take it through heavily populated counties in Northeast Ohio to get where you're going when you don't have to. You can go around the outside, so to speak, and put this in a place that makes more sense to people, that's more considerate of the environment and community."